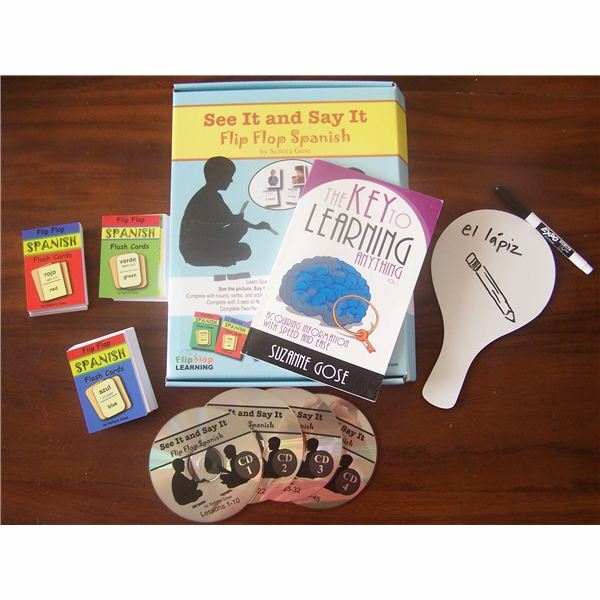 Flip Flop Spanish has created a program that allows students to acquire vocabulary and communication skills as they complete auditory, visual, and kinesthetic activities. See It and Say It: Whole Family Spanish includes flashcards with vocabulary and pictures, CD’s for auditory guidance, and a manual as a visual aide. A variety of enrichment ideas are spelled out within the curriculum and fun activities complement each lesson. The See It and Say It: Whole Family Spanish curriculum is comprised of three sets of flash cards, four audio CD’s, a written curriculum to follow along with as the lesson is spoken to the student, and a small dry erase board and marker for activities. According to the plan, one lesson that is broken up into three parts is to be studied per week. The first two parts the student listens to the CD’s and follows the directions using the flashcards to create sentences, practice vocabulary, etc. The third part of the lesson is to be worked on with an adult rather than with the CD’s. The purpose of this set up is to give the student a foundation, a chance to practice alone, and then a chance to interact with another person using what was learned. Each section of the lesson is short, around 10 minutes, and includes some sort of activity to aide in student comprehension. Any activity or worksheet that goes along with the lesson is explained and included within the workbook. Throughout the curriculum, students will encounter a variety of activities that can be performed alone, such as writing sentences and drawing pictures for vocabulary, but will also encounter activities that encourage interaction, such as conversation practice or vocabulary games. As mentioned above, this program can be used with almost all ages and can be adapted for almost all settings. The curriculum is designed for family or individual use because there is only one set of flashcards. Parents who are homeschooling their children will find this curriculum easy to use and teach during the week. Students will be required to pace themselves through the lessons, but will also need some guidance from parents or a tutor. While younger students will need more guidance, older students will be able to work through the program themselves, only needing support when an activity calls for the work to be done with a partner. The program would be very difficult to use in a large group setting due to materials and the fact that students go at their own pace, however teachers would be able to use this product at a learning center within their classroom. Once students are familiar with the lesson set up, they could work individually or with a partner during learning center periods. Whether used in centers, for personal use, or in a homeschool setting, it is recommended that students have a notebook, pencil, and extra notecards in order to practice writing sentences or write down new vocabulary as they work through the program. This product has a clear and easy to follow format that makes sticking to the schedule simple and attainable. I found this product suitable for young students as well as for adults looking to acquire a new language. Each lesson is short and builds on previous learning, which allows the students to build connections and retain information. While well organized, the program is extremely relaxed as well, which helps students feel confident about going at their own pace. The content is presented in a non-overwhelming manner and is clearly defined. Since each person learns in a different way, it is extremely helpful that this program incorporates the ears, the eyes, and the hands in learning. This is especially helpful when teaching students who have learning difficulties. As a learning specialist and ESL/SSL teacher, I found the curriculum to be helpful for students with a wide spectrum of learning needs. All in all, using the Flip Flop Spanish curriculum was a positive experience. Señora Gose does a great job of clearly explaining concepts and engaging students in the learning. I enjoyed how new learning was based on previously acquired knowledge to ensure student recall. Students are actively involved in the language learning process through building sentences, creating skits, playing hide and go seek, and much more. I loved the concise lesson format to ensure that students don’t lose interest or become overwhelmed. I believe that usage of tangible materials while students are looking at and hearing about each topic serve to reinforce the material in a useful way. The booklet explaining the learning styles that was provided along with the program was also very informative and would be an excellent resource for teachers and parents alike as they begin this curriculum. Finally, the fact that this curriculum can be used for a variety of ages and an assortment of learning needs only adds to the appeal of this product. It’s not always easy to find a multi-age language learning program that accommodates to diverse learning needs as well. While the advantages of Flip Flop Spanish program far outweigh any disadvantages, there is some room for improvement. The actual presentation of the curriculum seemed outdated in my mind. Using more exciting colors or an eye-catching picture would add to the appeal of the product. I don’t feel that the outside adequately advertises the excellent content within. Secondly, some mistakes were made in the recording as Señora Gose is speaking. While mistakes are natural and saying “um" is a hard habit to drop, those errors do take away from the professionalism of the product. While those small problems weren’t enough to turn me away from the product, I do believe fixing those mistakes will make the product seem less like a simple recording and more professional. In regards to the actual content and lesson planning, I thought the presentation, organization and review of concepts was excellent. In my opinion, this curriculum is well priced when compared with other language acquisition curriculums. In theory, for around $125, one will be receiving two years worth of Spanish curriculum. While there aren’t many tangible materials included, the flashcards and CD’s are extremely helpful to the learning process. The planning is done for the teacher or parent and the activities are fun and enriching. Overall, I would recommend this product. The program is sure to show results if applied correctly. Students will be making sentences in no time and will feel confident with the vocabulary that they know. As I mentioned above, the fact that this curriculum can be used with diverse ages and learning needs is a huge selling point that makes the product worth the price. The See It and Say It Spanish program is an excellent aide for helping students to acquire language with ease.